Daughters in Charge is a new division of Baker & Daboll, founded in 2013, to provide a global platform with information, courses, and podcasts, as well as a supportive community where daughters in family businesses can connect with one another. 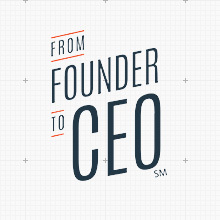 From Founder To CEO is a new division of Baker & Daboll, founded in 2014, dedicated to inspire, educate, and equip Founders to better build, scale, and lead their companies as they transition into the CEO role. We help great founders become superb CEOs.